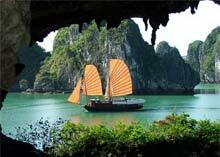 There are different routes for different Halong Bay tours. Please read carefully to choose your ideal Halong Bay tour. Why join Halong Bay tour - the bestselling of Vietnam tours for unique luxury travel style.